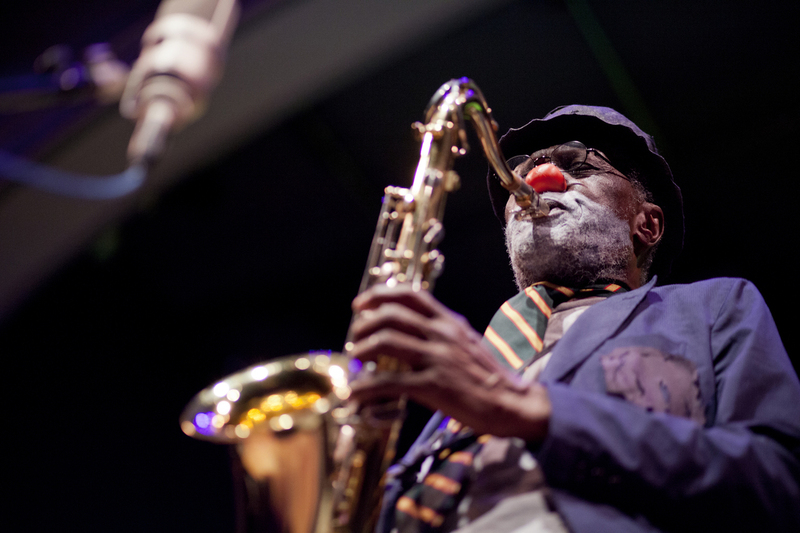 The Future Of Intense Art: A Free-Jazz Event Looks Forward : A Blog Supreme The artist-run Vision Festival, now in its 19th year, remains as staunchly committed to its mission as ever. But as its audience ages, it's sowing seeds of community outreach and childhood education. Charles Gayle was honored with a lifetime achievement award at this year's Vision Festival. On the event's opening night, Gayle performed as his alter ego, Streets the Clown. "We had to do things ourselves until something else kicked in," bassist William Parker said at a panel earlier this month. He was explaining how he came to co-found the Vision Festival. "And nothing's ever really kicked in." 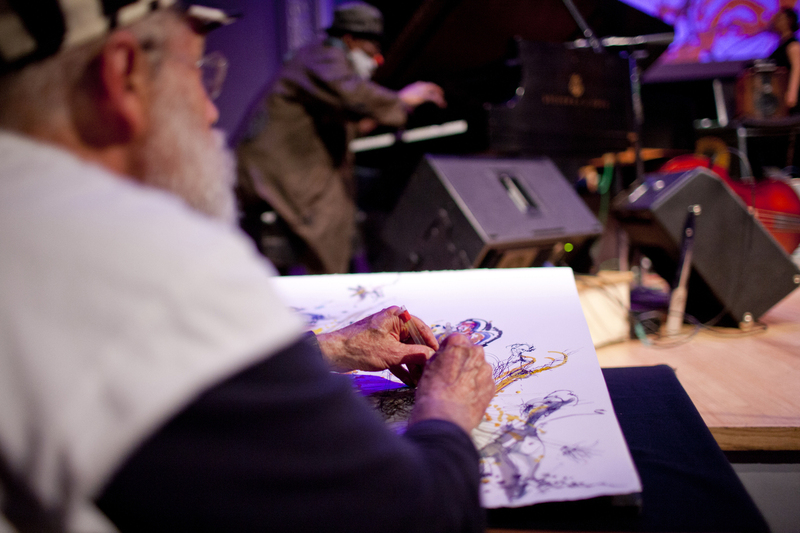 After five nights of scorched-earth improvising, poetry, dance and live painting, Vision Fest wrapped up its 19th annual incarnation on June 15. It continues to be New York's most renowned avant-garde jazz happening — partly because it upholds tough convictions about the links between art and politics, music and other media, self-expression and self-determination. It is entirely artist-run. Between sets of free improv at Roulette, the downtown Brooklyn theater, a full crowd of mostly silver heads kibitzed in the aisles. In the murmur you heard terms like "utopianism," "Bloombergization," "abstraction," "sound color"; as always, it had an air of homecoming. But as they look ahead to the festival's third decade, Parker and his wife, the dancer and festival director Patricia Nicholson Parker, remain tentative. Building a younger audience is a critical challenge, and funding in recent years has grown sparse. Nicholson Parker says she sees opportunity in the issues, and hopes to pass on her directorship to a younger person. "I'm the chief cook and bottle washer, and I can't do that anymore. If that's how it's going to be, the festival is going to come to an end — but I think we'll be able to transition," she told me during a recent interview at the couple's East Village apartment. "This is a kind of intense music that's about pushing your edges and living your life according to ideals. That's the same impulse as it is to be a resistance worker, and I think we need to spread it." This kind of talk has been out of vogue, at least in the mainstream, since the 1980s, when a soft barrier went up between aesthetic conversations and social conscience. So the Parkers are looking to change perspectives from the ground up. In the past few years, their nonprofit — Arts for Art, Inc. — has pieced together a small education program for young people in low-income areas of the city. With salons for young enthusiasts and affordable weekly concerts year-round, the organization is steadily sowing seeds. 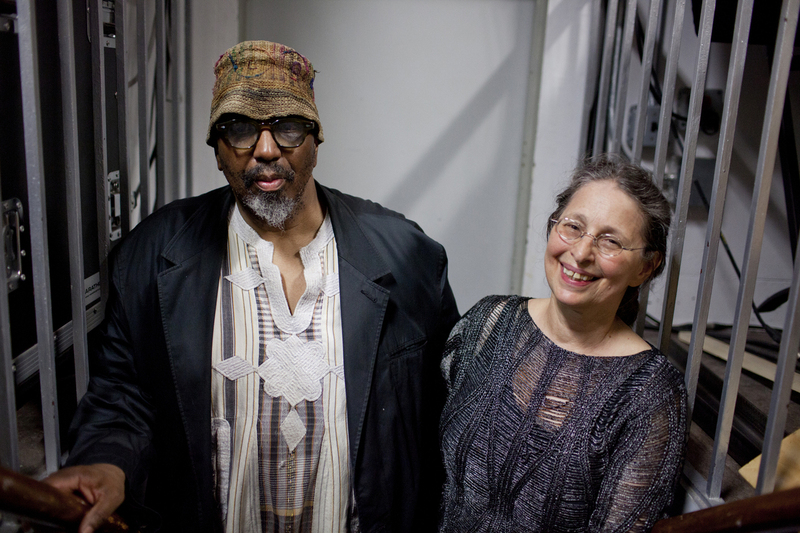 Bassist William Parker and dancer Patricia Nicholson Parker co-founded the Vision Festival. The Vision Fest has always made a point of celebrating its own heroes, partly because so few others will. Charles Gayle was this year's Lifetime Achievement Award winner. When Nicholson Parker presented him the prize at the festival's first night, Gayle was wearing an oversize brown sport jacket and the look of a man who'd arrived at the wrong address. "I tried to talk Patricia out of doing this," he said into the microphone, ho-hum, kind of joking. "But I understand why it's happening." Gayle, 75, played three sets that evening. In the first, he mostly stuck to bass, improvising in duo against the drummer Michael T.A. Thompson and teasing the instrument with rapid, ruffling plucks outside any scale or shape. When Thompson neared a funk groove, threatening to condense their dissolution into something recognizable, Gayle drew him away from it. In the second set, Gayle played saxophone, his primary instrument, with a quartet, yanking out a quivery dancing sound. For the night's finale, he made his way to the piano and directed a 10-person orchestra. The set started with a brief solo feature for each artist, then accrued into a grainy, twisting collage: strings, reeds, trumpets, the crackling drums of Andrew Cyrille, Gayle's harshly bright piano. Toward the end, things drifted down, and Gayle pulled them back up without doing much directing. A climax built. Kidd Jordan took his saxophone from his mouth, leaned toward his instrument mic, and shrieked, enacting wisdom and discomfort. Gayle grew up playing bebop and boogie-woogie in Buffalo, N.Y. During an interview at the Parkers' apartment, he remembered his development as a certain but unsteady process. "Things changed, as far as I'm concerned, because of the Civil Rights Movement," he said. "Most people were against it. When we played in a club, I remember a promoter just pulled the horn right out of my mouth when my eyes were closed. ... You create your own path. I'm a risky person by nature." Gayle eventually moved to New York City, where he lived without a home for more than a decade. He eventually made his name in the mid-1980s, already well past 40, with a Monday-night residency at the Knitting Factory. During the 1970s, a constellation of artist-run lofts held the avant-garde scene together, but by the mid-'80s, they were almost all gone. The scene was changing its dimension and purpose. David Murray, the young saxophonist who had become free jazz's poster child, explained his move away from an ethos of musical confrontation during a 1983 interview. "People don't want music they have to suffer through — Ronald Reagan's got them suffering enough already, and they want some relief from that," Murray told journalist Francis Davis. "They're in the mood to hear something snappy." He worked on deepening his straight-ahead playing and balladry; within a few years, the era of the Young Lions had set in and a mid-century swing feel was jazz's stock in trade again. Avant-garde musicians were scattered by the time the Parkers helped put together the Sound Unity Festival, a multi-arts celebration that foreshadowed the Vision Fest, first in 1984 and again in '86. In 1994, Nicholson Parker spearheaded the formation of the Improvisers Collective, which held weekly shows that always began with presentations and performances, and ended as group improvisations. She tried to lay down a communal approach to the collective's management, but found herself doing almost all the work. It folded after two years, and in 1996 the Parkers refocused on starting a single annual event. The first Vision Fest was held that year, and it's run consistently ever since. Jeff Schlanger, who paints improvised visual art inspired by musicians on stage, was also honored this year with a lifetime achievement award from Vision Festival. Four years ago, William Parker started giving music lessons at Campos Plaza, a housing development on the Lower East Side. Arts for Art's education program has kept growing: Weekly classes at Campos now run for the full school year, and a handful of affiliated musicians work with teachers throughout the city to help them bring free improvisation into their lessons. Last fall, Nicholson Parker launched the Under_Line Series, a monthly concert and discussion group aimed at engaging young adults in conversations around the music. (The hangs have been small, but they seem to hold promise as a think tank toward future action.) Each week, the organization's year-round Evolving Music Series presents affordable, sample-platter concerts with three varying bands. This all feels fairly new. Experimental scenes close ranks better than they colonize, and expansion hasn't been a big part of the Vision Fest's repertoire. Most of the teachers at Arts for Art's educational programs volunteer their time. Nicholson Parker said she worries about stretching her limited resources so thin that the festival itself could become insolvent. When the Vision Fest moved to Brooklyn in 2012 after 16 years on the Lower East Side, it felt like retrenchment. "We ran out of good spaces" in a rapidly gentrifying Manhattan, Nicholson Parker said. As she holds all the pieces together, she's wary of overburdening herself once again. Anaïs Maviel is a French graduate student who interned with Nicholson Parker last year and now volunteers as her assistant. She said she hopes to have a paid position with Arts for Art by this fall. "This is a transition time for the Vision community, because Patricia wants to pass along the Vision Festival to someone else," Maviel said. She and a small handful of other young enthusiasts "have been talking and having meetings" to brainstorm a future for the organization. "But when it comes time to go to the venue and check if they have drums there, or to reach out to the musicians, Patricia is the one that does it. It's her strength — she can think conceptually, but she can also get things done." Saturday's programming at the festival was themed "A Future for Vision," and it was concept meeting execution. The day began with a panel on how to use improvised music from around the world in children's education. Afterward, three ensembles of elementary- and middle-school-age students gave a recital in the concert hall, playing tunes by Sun Ra and Ornette Coleman and, as a matter of fact, Kool and the Gang. Some tentativeness was to be expected, but as eyes and sounds jumped around, the new-found musicians seemed comfortable knowing their efforts were going toward a larger engine. A boy who could not have been more than 7 took a well-paced flute solo in a minor key that showed an understanding of how interest and timing interact. One young pianist sounded like Alice Coltrane, giving the whole band life with stirring rinses up the pentatonic scale and occasional, rich accents in the upper register. "A lot of these kids don't have instruments at home, don't take private lessons," said violinist Jason Kao Hwang, who performed with Gayle on Wednesday and directed the recital's final, three-ensemble group performance on Saturday. "They only play when they're in school. So these teachers accomplish a lot with them. When kids get exposed to all different types of jazz expression, they love it. They feel what it means to make a sound, and they're wide open. You have no closed minds." That evening featured a handful of famous bands that continue to reshape the avant-garde. The spotlight for this music might have dimmed, but many have picked up where David Murray — who was in the audience for some of Vision Fest — left off, funneling frustration and aspiration into perceptive outsider art. Culture in post-Reagan America can be said to prize relativism over certainty, educated ambivalence over earnest assertion. Perhaps the time is right again for art that doesn't bargain? Maybe, after helping to sustain an avant-garde through the leanest years, the Vision Fest has a chance at reaping some rewards. Nicole Mitchell's Sonic Projections quartet closed the night with a set dedicated to the late saxophonist and organizer Fred Anderson, pulling new forms of logic out of chaos. In "Bright City," Craig Taborn drilled resonance out of the piano's nether regions; Chad Taylor used his whole drum kit to make something circular and well-fitted around it. Mitchell and saxophonist David Boykin entered with a high, firm, corner-turning melody. In her solo, Mitchell vested the flute with the power of a gale — invisible maybe, imperceptible certainly, and innately linked to nature.